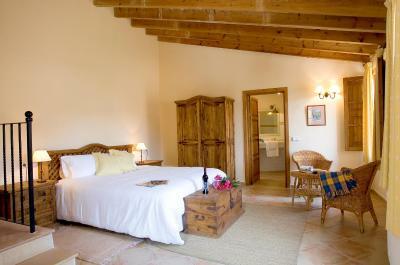 Lock in a great price for Hotel Dalt Muntanya – rated 8.5 by recent guests! Hotel really relaxing but due to bad weather we didnt enjoy the swimming pool and terrase. However really nice paella, great breakfast ! 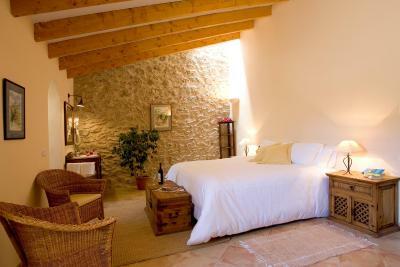 Beautiful location, comfortable room, great breakfast! No problem handling our very late arrival. Beautiful hotel and gardens in a lovely little village with so many amazing walks from the door step! We were very impressed with our room which had dual aspect windows over the village and mountains. 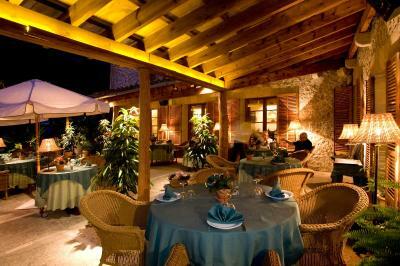 The food in the restaurant was delicious and the staff were so friendly and welcoming. Perfect place, calm, fireplace in dining room, nice staff. Great when you want to disappear and relax. 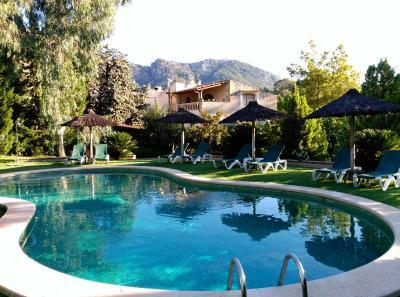 Orient is an excellent location in Tramuntana, but a very small community with a couple of hotels and restaurants. A nice and quiet place to stay. 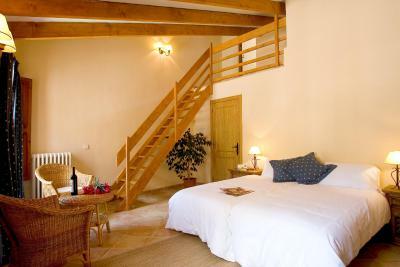 Nice rooms, good restaurant (which is open all day) and a well assorted breakfast buffet with small daily changes. 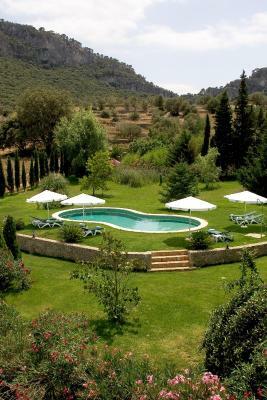 This place is an excellent Base for exploring all of majorca as we did. Photographso on website do not do it justice. It is perfect! Lovely situation and the terrace dining area was very pretty. Amazing hotel I always wanted to stay in. Beautiful scenery, lovely restaurant and excellent customer service! Stunning location in the mountains. Wonderfully quiet at night. Gorgeous pool. Great walks (ask the manager for the route to Castell d’Alaro: 1 hour uphill for fast walkers; 1.5 hours for slow - stunning views from the Castell - see photo attached). I particularly enjoyed the staff here. The manager can seem a little gruff on first meeting but underneath he’s a sweetie! Good food in the restaurant. Suggest you stop off at a market en route to buy water, unless you want to pay restaurant prices for all the bottled water you drink. Two good little markets in nearby Alaro (there is no market in Orient): Bip Bip or Eroski. 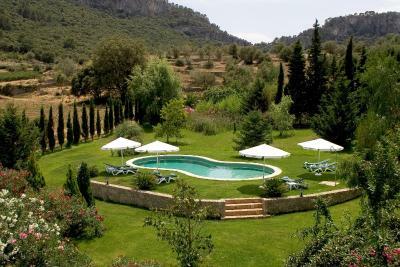 Hotel Dalt Muntanya This rating is a reflection of how the property compares to the industry standard when it comes to price, facilities and services available. It's based on a self-evaluation by the property. Use this rating to help choose your stay! Hotel Daltmuntanya is in the Tramuntana Mountains of Mallorca, overlooking the Orient Valley. 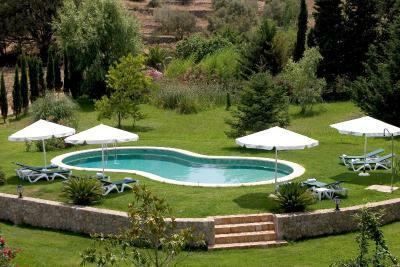 Set in gardens, this charming, rustic hotel offers a seasonal outdoor pool and a free Wi-Fi zone. 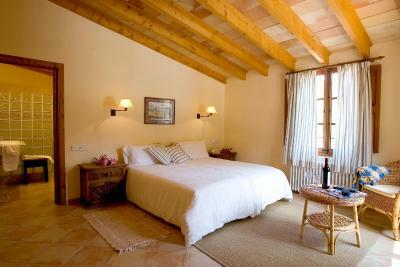 Heated rooms feature tiled floors and wooden beams. There is a satellite TV and a safe, and the private bathroom comes with a hairdryer. 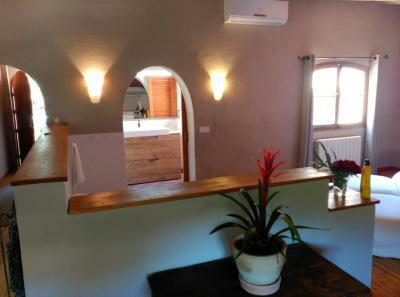 Daltmuntanya Hotel offers a snack bar, a lounge bar and a garden terrace. Free parking is available nearby and the hotel has a tour desk. 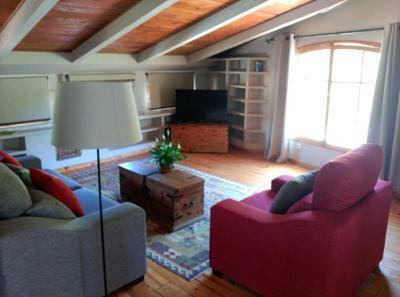 Palma Airport is 21 mi away, and it is a 30-minute drive to the picturesque Port of Soller. 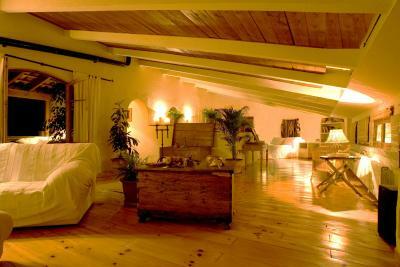 When would you like to stay at Hotel Dalt Muntanya? 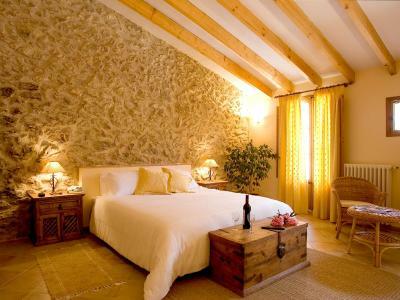 This stylish, rustic room comes with satellite TV and a private bathroom. Each one is individually decorated. This suite has a private entrance, seating area and air conditioning. 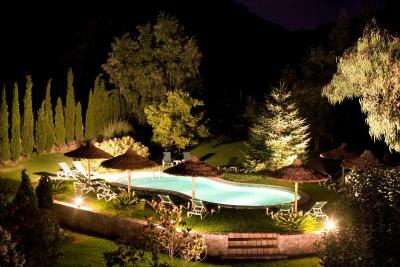 House Rules Hotel Dalt Muntanya takes special requests – add in the next step! Hotel Dalt Muntanya accepts these cards and reserves the right to temporarily hold an amount prior to arrival. Please inform Hotel Dalt Muntanya of your expected arrival time in advance. You can use the Special Requests box when booking, or contact the property directly using the contact details in your confirmation. We had a great stay, all complaints are minor! The WiFi was a bit slow. We didn't try the restaurant, partly because there wasn't much on the menu that met our dietary requirements. Not all rooms have nice view outside. If you are not best driver, it can be harder to park larger car. Internet is not so fast, but this place is perfect when you want to relax and keep away from everyone and everything, so no problem. Note that rooms do not have airconditioning, but a fan is provided. There should be more than one Nespresso machine available at breakfast. The garden falls into shade in the afternoon during the shoulder months. The manager was extremely grumpy, unfriendly and un-accomodating. Senior management were surly and disinterested. No welcome or care for guests. Service at dinner was poor. We weren’t asked if we wanted more drinks, dessert or coffee. A real shame because this hotel has huge potential. Owners need to up their game to compete with customer service at other hotels nearby. 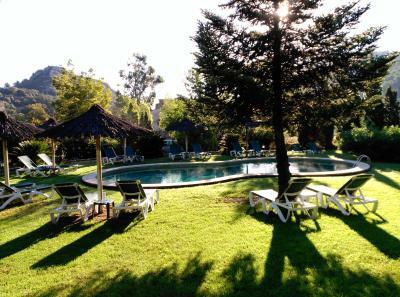 the hotel is situated in the mountains, it’s a little bit colder than on the coast, so swimming in the pool was actually impossible due to cold water in it and the weather. We liked the room, but we didn’t like the location od it, it faced the restaurant tables, so there were lots od people looking at our room. We couln’t open the huge Window without curtain (that was sad). No AC in the bedrooms but there are fans. Very poor internet. The hotel literature makes it clear that there is only WiFi in the communal areas but for more than half of my stay it was impossible to get a decent connection, even in the communal areas. No big deal as obviously if you wish to send an email you can simply hotspot off your phone (phone reception here is good), but if you are planning to stream movies in your room at night or be sending long emails to your office all day then this is not the place for you. If you are looking for total peace and an escape from the world then this is the place. I loved it! We got the only room with AC which made our visit excellent. Best food on our trip, and nice staff. 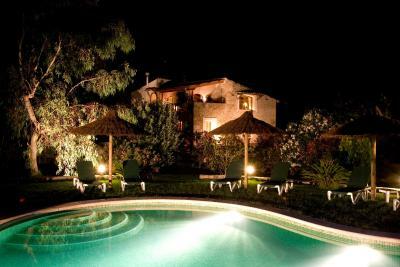 Hotel Dalt Muntanya is situated at absolutely gourgeous place deep in the mountain. If you are looking for relaxing place without people this is the right one.